Tibet, Goshaikunda, and the holy lakes are the Trishuli’s origination. 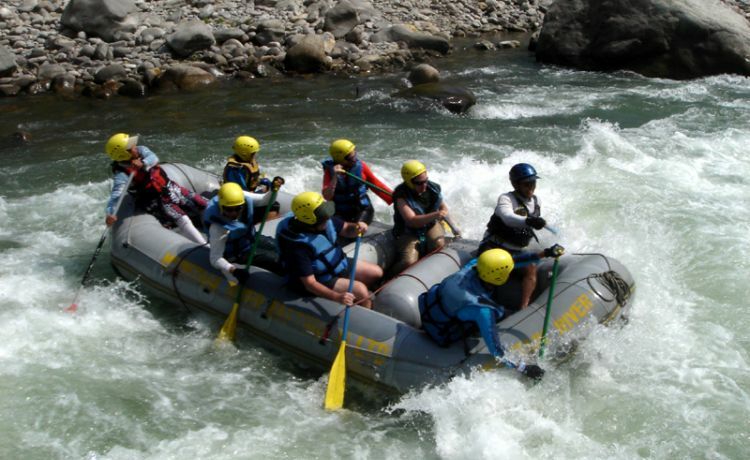 Rafting in Trishuli River can be taken as the modest rafting. People are familiar as the classic river rafting zone to the Trishuli. The river journey begins from the grade II till IV. The river guide instructs you before you reach in particular rapids named like Snell’s Nose, Teen Devi, Ladi’s Delight, Upset and Surprise. The thrilling experience at the moment with all rafters in the splashing water in between the waves is amazing. The rafting from the Upper Part is operated in Monsoon and Post Monsoon (July-October) but the down part is operated in June.So, the place depends upon the length of your raft or the season. Those who would prefer the short trip about 3 hours’ drive from Kathmandu to Pokhara or to Chitwan National Park; will be the best option to have fun with the Highway scene. There will be of single day raft up to 3 days. Generally it begins from Charaundi, 85 km in distance from Kathmandu.The rafting at Trishuli while encountering rapids is straight forward, easily negotiated and well spaced out. Natural scene and the life in it. Day 01:Drive from Kathmandu to Charaudi and do rafting till Fishling and return back to Kathmandu. Day 01Drive from Kathmandu to Charaudi and do rafting till Fishling and return back to Kathmandu.After breakfast, we drive to Charaundi, the take- in point through Prithivi Highway. It is just 3 hours scenic drive passing through countryside, streams and following the Trishuli River. This river is absolutely good for the beginners because it has mild rapids from where we begin even though it has II to IV grade in different locations. We smoothly, playing in the water with other rafters nearby in the white water from Goshakunda Lake and Tibet. We take our lunch in between and after short break, we continue and take out at Phisling. From there, we drive back to Kathmandu.